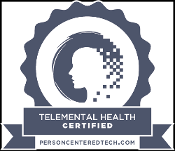 Person Centered Tech’s Telemental Health Certification Program aims to ensure that mental and behavioral health professionals are properly prepared to deliver their health care services remotely, primarily through secure and confidential videoconferencing services, in a professional and effective manner based on research and professional standards. Are you a client or potential client? If you found this page through the website of your therapist (or someone you’re considering working with), then congratulations! The Person Centered Tech certification badge you saw on their website means that you’ve found someone who has completed our certification program. Certification from Person Centered Tech means that the certified professional has been taught how to choose, use, and setup their tech in order to make sure they can be effective for you when working via the Internet. They’ve also been taught quite a few standards of practice, ways to help you get the most out of online work, ways to help you prepare for emergencies, and a number of legal-ethical standards they need to be familiar with in this line of work. Our program focuses on training professionals to work over secure, privacy-protected videoconferencing software. However, your provider may have additional experience or training using other media such as secure email or texting. So the Person Centered Tech program also covers a number of considerations to keep in mind when working with clients remotely by any medium — not just video. While we have not personally verified that each certified professional can do all of these things perfectly, we have verified that they successfully completed our training program, and that they passed the various exams they were challenged with along the way. What resources does Person Centered Tech have for me as a client receiving online therapy? Please check out our Client Help Center! It has quick and easy tips for preparing your space and your own tech setup to get the most from your online sessions. This is a free service that we provide for the community. There is no cost to you or your provider for using these resources. Are you an employer or other person looking for trained telemental health providers? Welcome! We have a special page just for you. Please take a look. Also be aware that we are happy to speak with you about our program and about the providers we train. In addition to the information accessed via the button below, you can contact us at 503-893-9717 | info@personcenteredtech.com.